Police forces across Europe could get data from net firms almost immediately under new European Commission plans. The proposals aim to help police act quickly in the wake of terror attacks to round up collaborators and suspects. One option would let police in one nation ask for data held by a net firm in another, without having to ask for permission from that country's force. Current rules mean investigators in one country have to ask police forces in another to get the data for them. Justice Commissioner Vera Jourova said the proposals would be used to draw up future legislation. "I am sure that now in the shadow of the recent terrorist attacks and increasing threats in Europe there will be more understanding among the ministers, even among those who come from countries where there has not been a terrorist attack," she told Reuters. The proposals drawn up by the Justice Commissioner will be presented on Thursday at a meeting of the region's justice ministers. The meeting will also consider the types of data that should be covered by the proposal and whether it should just include information people post or also cover "metadata" that tracks their location. Ms Jourova said the third option was an "emergency possibility" that would require more safeguards built into it to protect privacy. 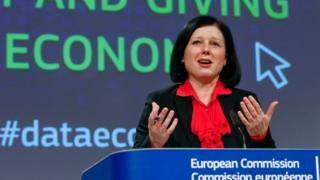 "You simply cannot massively collect some digital data for some future use," said Ms Jourova.